For the last 10 months I have been going to a bariatric clinic and lost 40 lbs with the intention of having weight loss surgery to help get the rest off. I hit a small speed bump due to some rules of my insurance policy and I had to change clinics, which was a huge disappointment to me, but I did end up having a sleeve gastrectomy performed on Nov. 2. 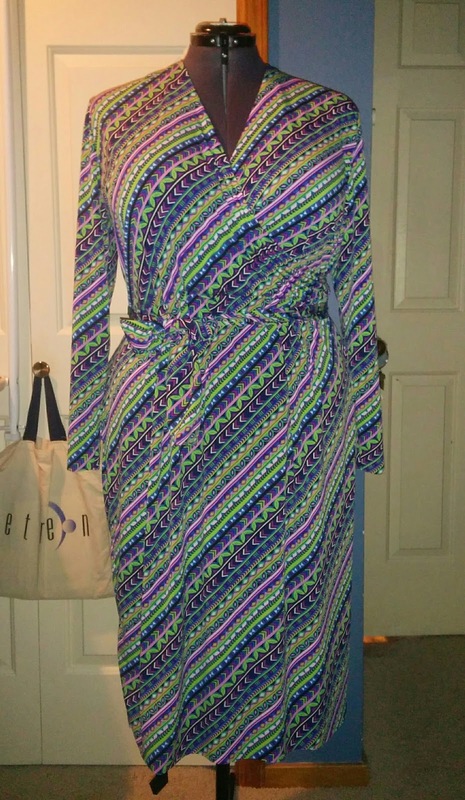 Leading up to the surgery, I knew I wanted to make something to wear home from the hospital. 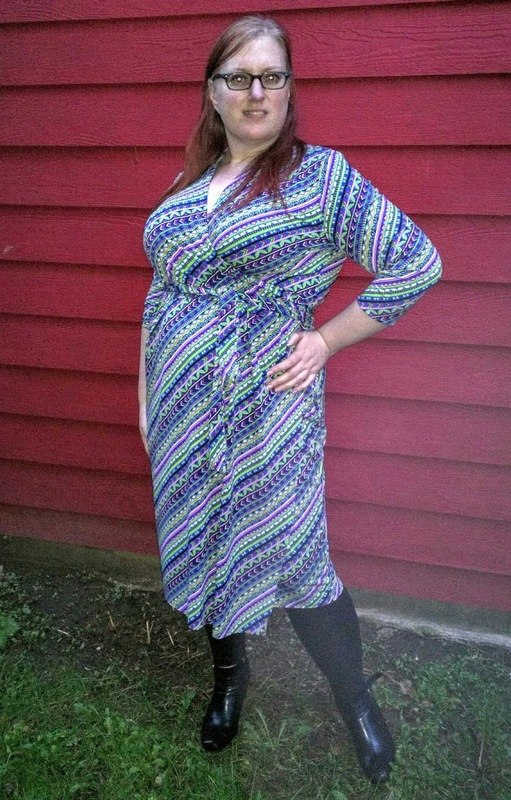 I have been wanting to try the Olivia Jersey Wrap Dress from Named Clothing since I acquired it as part of the Monthly Stitch's Chill Out IPM pattern bundle. 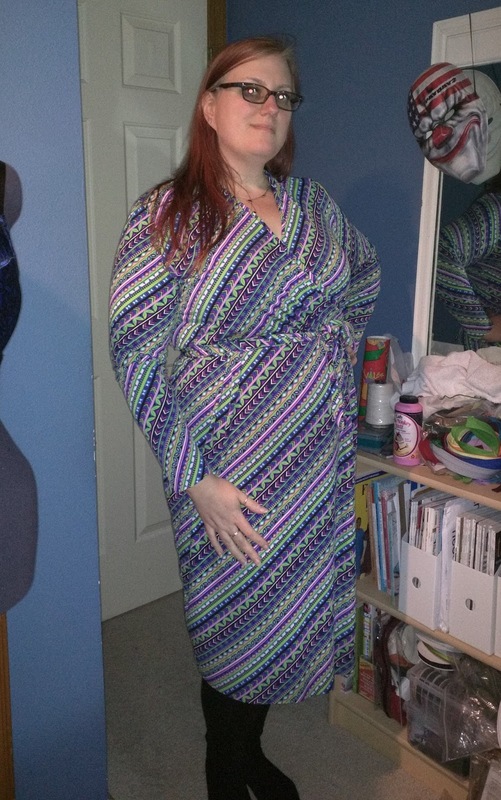 And I knew I was going to be sore, so I figured a wrap dress would be easy to put on, would be comfortable and still look stylish. Looking at the measurements, my waist and hips fall into the size 20, but the bust measurement is 3 1/4" smaller than my bust size. 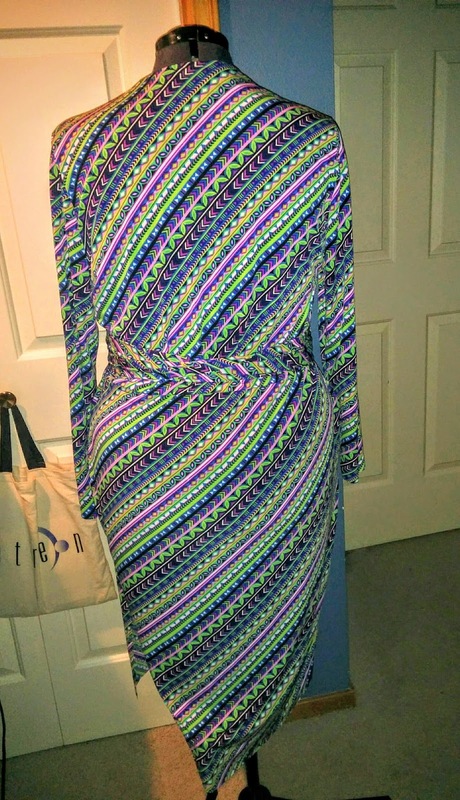 However, after cutting out the size 20 pieces and comparing the bodice to some of my other knit dresses that I know fit, I decided to not do an FBA. Well, lo and behold, the dress fits perfect exactly the way it's drafted. Well, did I say perfect? It could actually use a sway back adjustment. But that's about the only change I would consider doing. It covers quite nicely. I was assuming since I didn't do an FBA that I would be showing off a ton of cleavage, but nope. 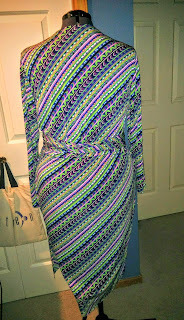 The neckline doesn't gape at all and there is a large enough overlap that there is no chance of flashing. 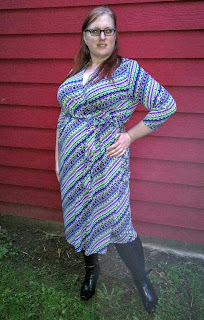 I definitely will be making more of these dresses, but I might not make the next one in this size. The outside photos were taken today and the indoor photos were taken after I got it to a wearable state, the night before my surgery. I hadn't sewn the facing down yet, so that's a little sloppy looking, but I did that today. 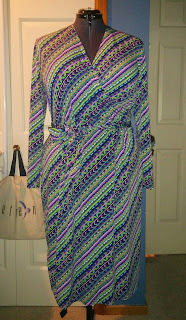 I wore my new dress home from the hospital yesterday and I got several compliments from the nurses at the hospital. I was going to just say thanks and let it go, but my husband made a point of telling them that I made it. Lol. Oh, and the surgery went well and I'm feeling pretty good, although it hurts a lot to cough or get up from sitting or laying down, but a lot less after I've taken my lovely pain medication. I took two weeks off work to recover and I have a few things I cut out some time ago that I plan on getting sewn up so I can wear them a bit before they are too large.